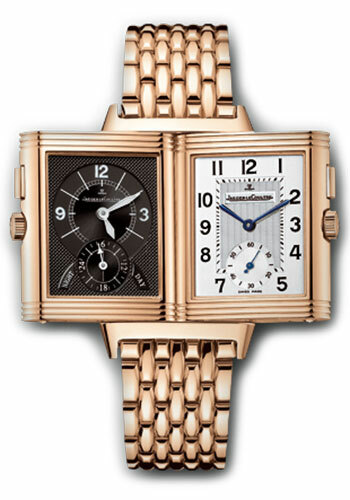 18K pink gold case, silvered guilloché dial with black transferred numerals, back dial is Black guilloché with luminescent transferred numerals, hand-winding calibre 854/1 movement with (back displays second time-zone, 24-hour display), approximately 45 hours of power reserve, pink gold bracelet. Water resistant to 30 meters. 18K pink gold case, silvered guilloché dial with black transferred numerals, back dial is Black guilloché with luminescent transferred numerals, hand-winding calibre 854/1 movement with (back displays second time-zone, 24-hour display), approximately 45 hours of power reserve, alligator leather strap with double folding buckle. Water resistant to 30 meters. 42.2 mm x 26 mm 18K pink gold case, 9.3 mm thick, pink gold bezel, silvered and black guilloché dial with black and luminescent transferred numerals, caliber 854/1 hand-winding movement with second time-zone, day/night indicator, and 24-hour display, approximately 45 hours of power reserve, brown alligator leather strap, pin buckle. Water resistant to 3 bar. Stainless steel case, silvered guilloché dial with black transferred numerals, back dial is Black guilloché with luminescent transferred numerals, hand-winding calibre 854/1 movement with (back displays second time-zone, 24-hour display), approximately 45 hours of power reserve, stainless steel bracelet. Water resistant to 30 meters.